The Sludgelord: The Sludgelord News: DEMOLITION HAMMER Preorder for vinyl reissues of ‘Tortured Existence' and 'Epidemic Of Violence' available now! The Sludgelord News: DEMOLITION HAMMER Preorder for vinyl reissues of ‘Tortured Existence' and 'Epidemic Of Violence' available now! 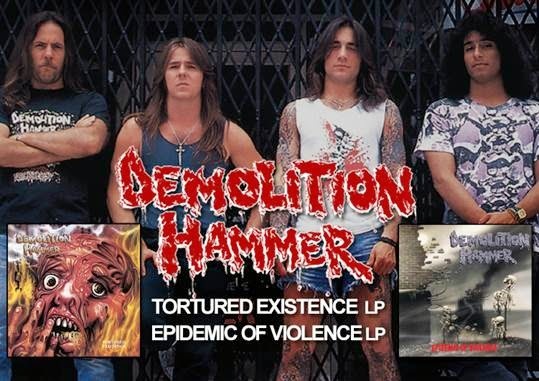 On March 9th, 2015, Century Media Records will reissue DEMOLITION HAMMER’s quintessential “Tortured Existence” (1990) and “Epidemic Of Violence” (1992) on vinyl featuring heavy 180g wax and the original cover artworks! The following editions are now available for pre-ordering via www.cmdistro.com!